Style and class at a sharp price. Is it the business? Strong in both bass and treble, the midband is smooth and even, but the sound is also a little congested. Monitor Audio has been in the hi-fi speaker business since 1972, so it must have been doing plenty of things right down the years. The company underwent the transition from original founder to new ownership nearly a decade ago, and its hierarchy of Bronze, Silver and Gold hi-fi oriented ranges continue to prosper. The Silver RS series represents the third generation of the company's attractively styled mid-price range. And styling is very much at the core of the RS6 agenda, with a nicely grained real-wood veneer covering all surfaces, gently smoothed edges, moulded silver driver trim, and a neat badge mounted on the top surface. A proper plinth finishes things off, supplying good physical stability; it comes with chunky spikes that are locked by large knurled plastic wheels. These look good, work well and avoid putting too much strain on the sockets, as well as ensuring secure floor coupling. Alongside various home cinema extras, four stereo pairs lie at the heart of the Silver RS line-up - a standmount and three floorstanders, the latter distinguished by the size of their enclosures and the quantity of bass drivers used. 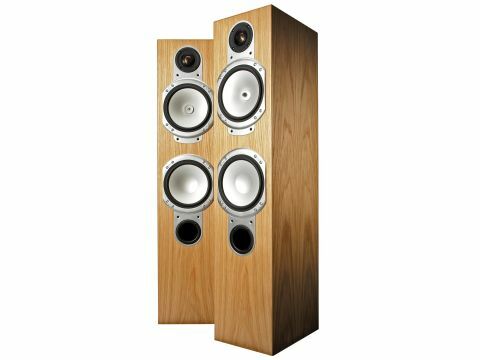 Whereas the RS5 is a straight two-way, with just the one bass/mid driver, this £600 per pair RS6 adds an extra bass-only unit and operates as a two-and-a-half-way; the still larger RS8 is a three-way with twin bass drivers alongside a similar size midrange. All the diaphragms here are aluminium/ magnesium alloy, deep anodised to create a ceramic oxide surface coating to increase stiffness and extend the pistonic operating range. Both the bass-only and bass/mid drivers have 120mm diameter cones in 160mm moulded polymer frames, though they differ in the way the central voice coil cover is handled - a shiny 'bullet' centre plug is used for the bass/mid driver, while the bass-only unit finishes the cone as a dish. Both are separately port-loaded. The tweeter has a 25mm metal dome, derived from that used in the Gold series, while twin terminals are fitted on the rear for bi-wiring or bi-amping. As the in-room measurements indicate, the RS6 is suited to siting well clear of walls, though port-blocking bungs are also supplied if close-to-wall siting is unavoidable. That extra bass-only driver ensures a full and powerful bottom end, with the sort of warmth and tonal richness that is all too often lacking in simpler two-way designs. That said, it can sound too heavy on some recordings, with a tendency to thump at times. That full bass end balances up with a relatively strong treble output, and while that element of compensation makes plenty of sense, it's also true that the top end is inclined to draw attention to itself. Although the overall tonal balance is impressively neutral, and happily free from the sort of midband emphasis found elsewhere in this group (and common among modestly priced speakers in general), the RS6 is not particularly transparent, and does lack sweetness and delicacy. Its music making is rather matter-of-fact, lacking dynamic tension, and it somehow doesn't manage to touch the listener on an emotional level as effectively as it might. And while that smooth midband is creditably in proper perspective, it's not without a measure of congestion and nasal coloration. This keeps an otherwise fine speaker from recommendation. Although Monitor Audio claims a sensitivity of 91dB, under our measurement regime (based on averaged in-room far-field traces) it only achieves 88dB, which is a significant shortfall. The 6-ohm impedance rating was comfortably met though, the minimum of around 4 ohms coinciding with the port tuning frequency of 42Hz. The advantage of the extra bass driver may be seen in the relatively full and generous output through the bass region, 40-200Hz. While the rest of the audio band holds within tight and impressive /-2dB limits, it does show certain traits that are likely to affect the character of the reproduced sound. The RS6 lacks a little output 220-600Hz and again 1.3-2.2kHz. However, the lower treble (2.5-5.5kHz) is quite strong. There's also a sharp rise above 17kHz, but this probably above the limit of most people's hearing and is not untypical of metal dome tweeters.